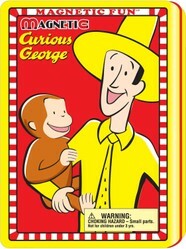 Curious George and his patient friend, the Man with the Yellow Hat are as charming and mysterious as ever! If you or someone you know was a fan of this mischievous monkey in the old days, you'll enjoy looking at the retro toys I've gathered here for fun. Maybe you'll want to share them with a young someone, too, and relive through them your earlier fascination. I have only fleeting memories of George and the man with the yellow hat from my own childhood. I'm sure I was exposed to them, but I don't have strong memories of their antics. However, my second son fell in love with the books about the little monkey one day on a trip to the library. He read one book, then had to read more and more. He later owned a copy for himself -- Curious George Rides a Bike -- and we read it together over and over again. He pleaded for another book -- Curious George Flies a Kite -- and so we had some variety in which story to read at naptime or at night before bed. It's not that they were his only books. He was just that kind of kid who wanted to read a favorite story again and again until we could all repeat it by heart. Santa Claus brought a stuffed George the next Christmas, and then the two of them, boy and monkey, were inseparable for years. I'll let you in on a little secret: that silly monkey is still in my basement hiding in a box of tossed aside things and has been for the past quarter of a century. Now it's not the boy who has a hard time separating from that smiling face, but the sentimental mother. Does/did your child know George from a book or from the TV show? My oldest was born the same time the PBS show started. So he saw George first through TV, but I introduced him to the books at a very early age. We don't have books about George here, but TV show is pretty popular. We read the books first. My husband introduced me to curious george... I didn't know about him until I was an adult. Because we're talking about a children's book character from the past, I thought I'd focus on retro toys that you might enjoy knowing about instead of just talking about the books. The books themselves are cute, but they are still readily available. The feel of some of the old fashioned toys may help revive a little nostalgia associated with your own childhood or the childhood of your son or daughter. A lot of folks collect retro lunchboxes. They are cool as a container to carry your lunch to school or even to work, but they are useful for carrying other things, too. You can keep any number of things in a tin box, from craft supplies to antique toys to your clean socks. These tin lunch boxes look cool on a shelf, too. Keeping with the tin toy theme, I've included this playset. It would make a really handy take-along if you are going on a car ride. The little magnet pieces stick to the tin tray so that they are less likely to get lost, and they can entertain your young one in imaginative fun without having to rely on an electronic gadget. The set contains three sheets of magnets, about 50 in all. You can carry them with you and take them out whenever you need a quiet activity to keep your child occupied for 15-20 minutes. Great for travel, this toy could also be useful if you have to wait at a doctor's office or want to keep a little one occupied at a visit or at a restaurant. Simple toys are often better at letting the child take the lead and play (more active) rather than be entertained (more passive). The child has the opportunity to act out a favorite Curious George story or make up a situation on his or her own. Some people have complained that the paint on the magnets came off easily when washed with baby wipes or window washer. I would be careful to only use a very mild soap or just a damp cloth should the surface get dirty from sticky fingers. I'd also be careful to wash your child's hands afterwards before serving food, as you never know whether a little color may come off onto the hands. That's just me being cautious. Sometimes a simple wooden toy can go a long way. 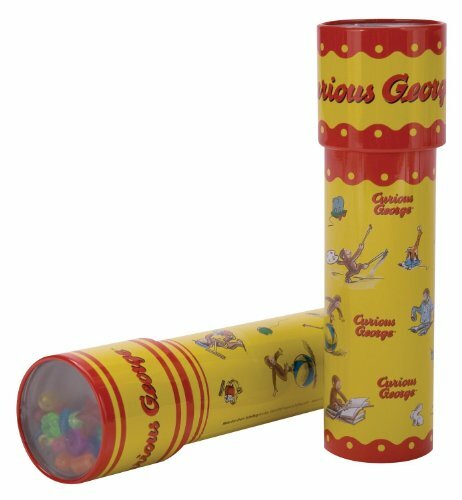 If your child is a George fan, he may like this little toy that does nothing but roll around on the floor. Our little monkey has his usual smiling face that says, "I know I'm not supposed to be doing this, but . . . ."
George Is Also a TV Star! This Jack-in-the-Box Pops Up with George! And the Plush Version, too. If you have a little Curious George and Curious Janet in your house, perhaps this Curious George Jack-in-the-Box would delight them. Turn the crank and suddenly up pops George grinning his welcome! This type of toy was standard fare in the past, usually with a clown popping up. On that page linked to above, you'll also find links to other Jack-in-the-box themes, such as the Very Hungry Caterpillar pop up and the traditional clown. Or maybe they'd just prefer a plush version of George to hug snuggled in bed. This stuffed friend stands 16 inches tall and wears his red shirt. 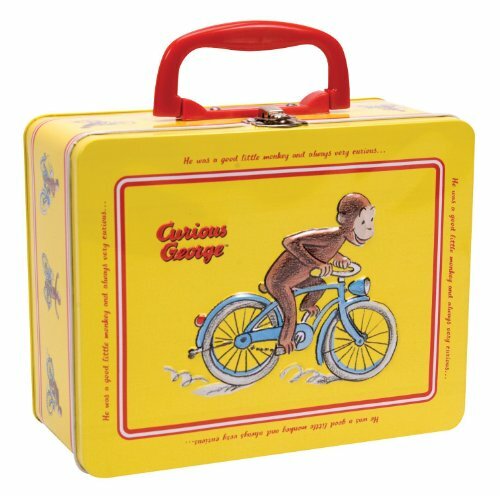 CURIOUS GEORGE KEEPSAKE LUNCH BOX. I hope you've enjoyed this little romp into the past with good ol' George and the Man with the Yellow Hat. Don't forget to leave me a note about your memories of the famous monkey and whether he was an important character in your family's reading habits. Perhaps your children met George as a TV character. Or maybe he was just in the background as a smiling face on other kids' books and T-shirts. Whatever his significance for you, I'd appreciate your input. 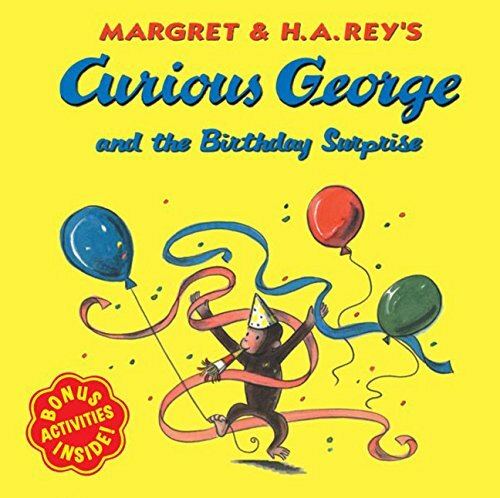 Anything Curious George is really fun and cute. They do have a certain something, @CruiseReady , don't they? Retro is such fun! 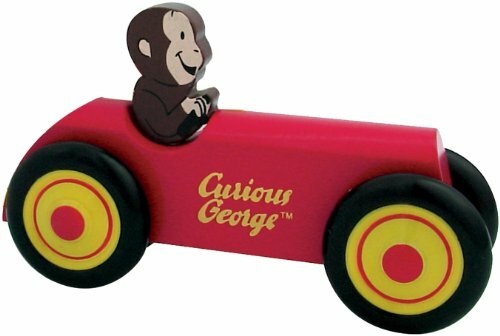 Though I didn't know Curious George as a child, I think I would have liked him, i sure like the retro items featuring him. I like seeing the retro toys, too. Such simpler times. I don't know as much as I should about this fellow, but do love the retro toys, they bring back such memories! One of my sons was a big fan, too. These are so cute. My father-in-law used to give my children Curious George toys for Christmas, and we loved them. It's always fun to share what meant a lot to us as kids. I have always loved Curious George, so it has been lots of fun sharing this mischievous monkey with my kids. They love the books, TV show and movie. So wide open, isn't he? With a little bit of mischief.